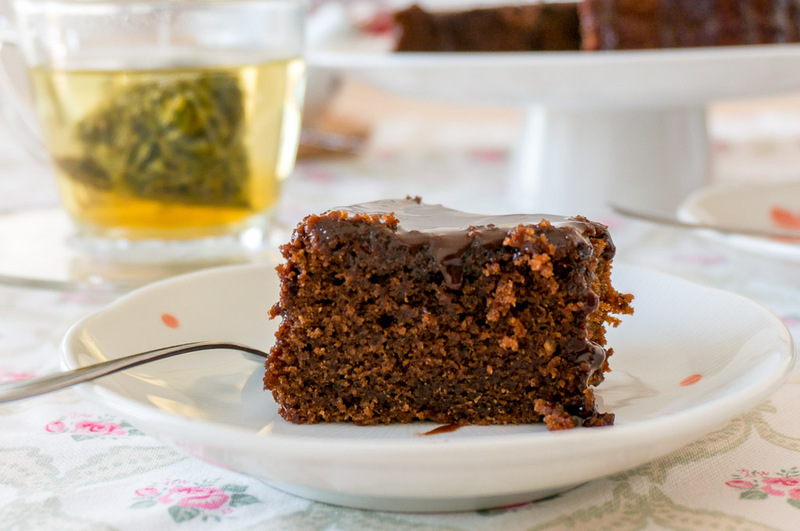 I first blogged about this honey chocolate cake back in 2011 and I thought this would be a great chance to update this recipe with both clearer instructions and better photos as it fits the Little Thumbs Up theme this month – honey! I always have a jar of honey at home – besides mixing spoonfuls of it with lemon slices into my cup of water occasionally for a soothing treat, I use it often in both sweet and savoury foods. Most of the time, only a little bit of honey was needed as the honey taste, but this time round, just for this cake, the honey is the main star here! 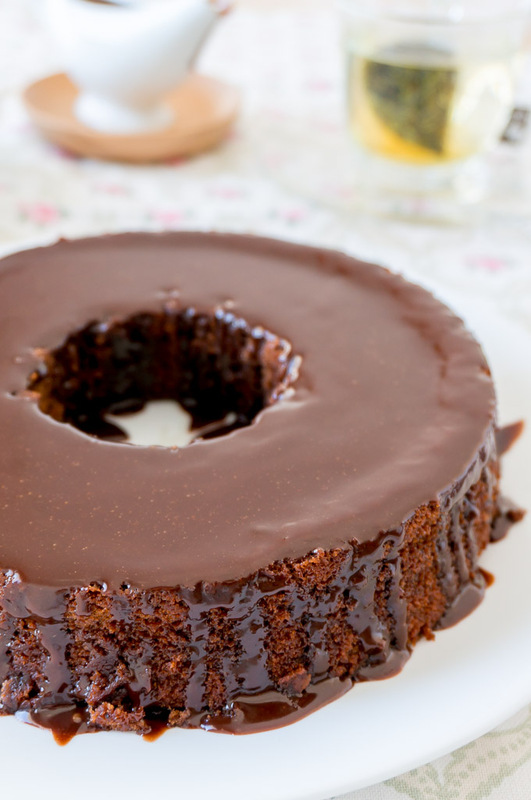 This honey chocolate cake is an easy food-processor-cake – i.e. a dump everything in a food processor and blend together kind of cake. I had made it before with a hand-held blender and this time round with an immersion blender as I still have yet to own a food processor. 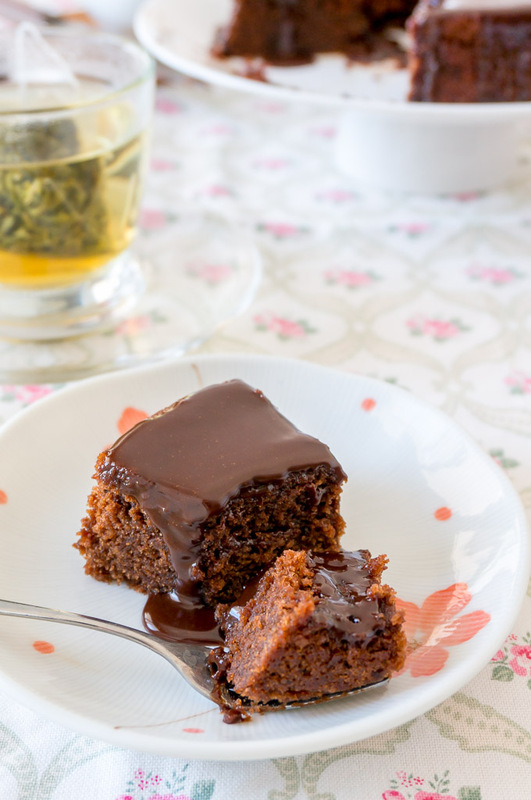 Both methods work perfectly fine and the resulting cake turned out soft, moist and absolutely delicious with a nice honey taste in every bite – all I need is just a cup of tea and I’m ready for a tea-break! And here’s how to make it! 1) Preheat oven to 180C / 355F (not fan-assisted). Grease and line the bottom of a 8-inch tube pan with parchment paper. Set aside. 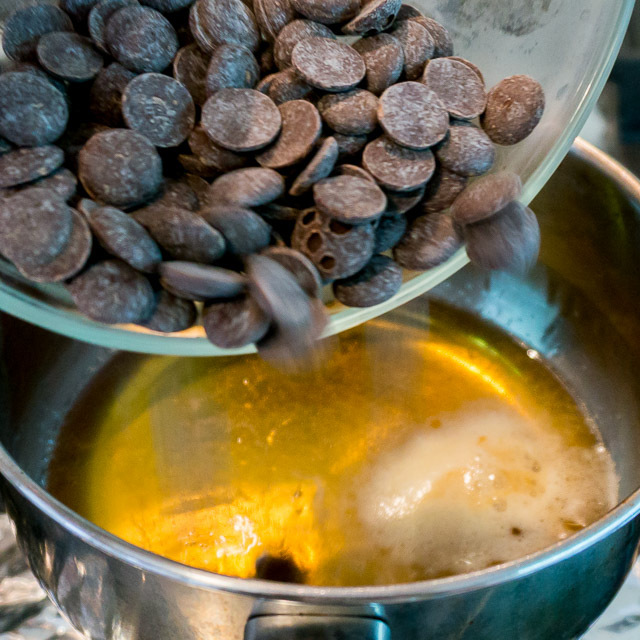 2) Melt chocolate either in a microwave or double boiler. Set aside and let it cool for 10 minutes. 3) Measure the rest of the ingredients (flour, sugar, cocoa powder, baking soda, vanilla, butter, honey and egg) except water in a mixing bowl. Add in the cooled, melted chocolate. 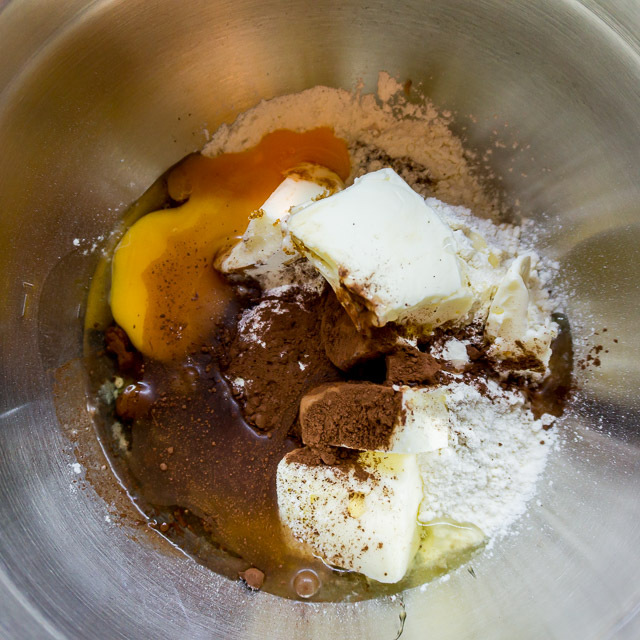 4) Blend with an immersion blender or electric mixer until everything is well-mixed together. The batter will be quite thick so you might need to scrape the sides and bottom of the mixing bowl a few times with a spatula so that everything can be blended together. 5) Add in 1/3 of the boiling water, blend until incorporated, then repeat until all the water has been incorporated. Scrape the sides and bottom of the mixing bowl to make sure everything is incorporated together. 6) Scrape the batter into the prepared cake tin. 7) Bake in the center rack for 30 to 40 minutes until a skewer inserted into the centre comes out clean. Let the cake cool completely on a wire rack. 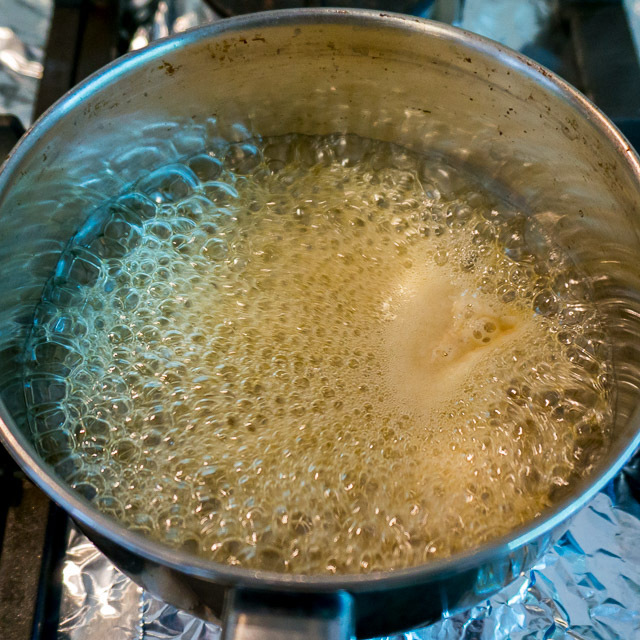 8) Whisk honey and water in a small pot and bring to a simmer. 9) Remove from heat and add in dark chocolate. 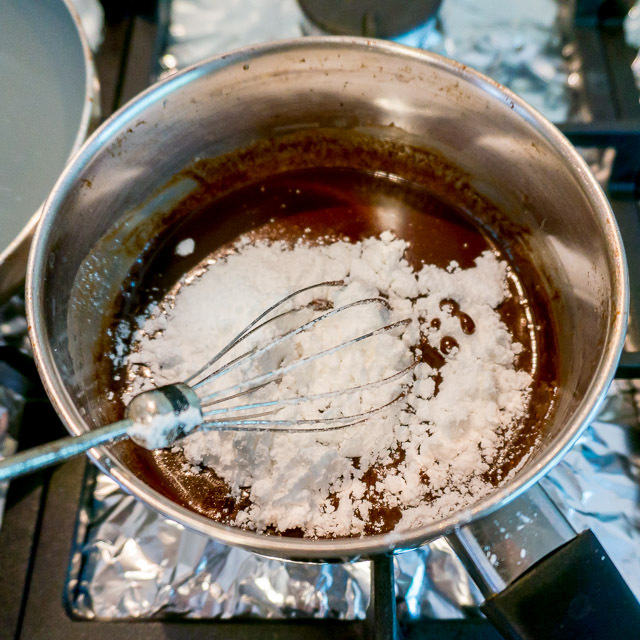 10) Whisk until chocolate has melted then add in the icing sugar. 11) Whisk until the icing sugar has been incorporated. Let cool slightly for 5 to 10 minutes until the sauce has thickened then pour it over the cake. Bring out all the ingredients that are in the refrigerator and let them come to room temperature for at least 30 minutes. Preheat oven to 180C / 355F (not fan-assisted). 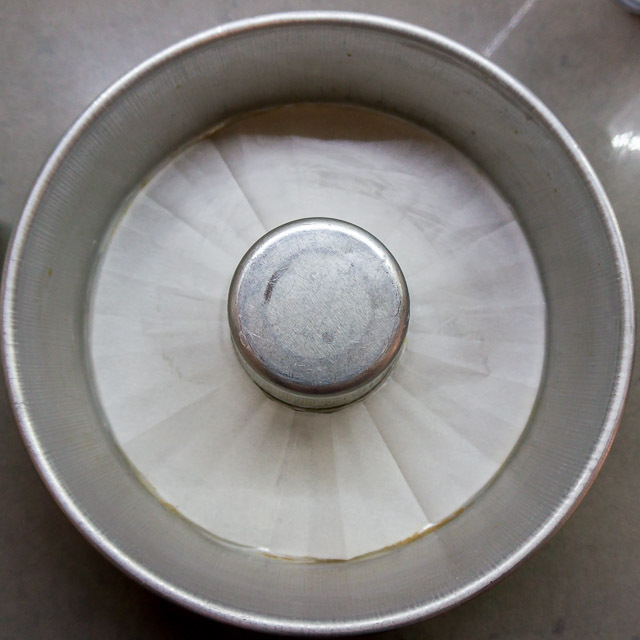 Grease and line the bottom of a 8-inch tube pan or 7-inch round cake tin with parchment paper. Set aside. 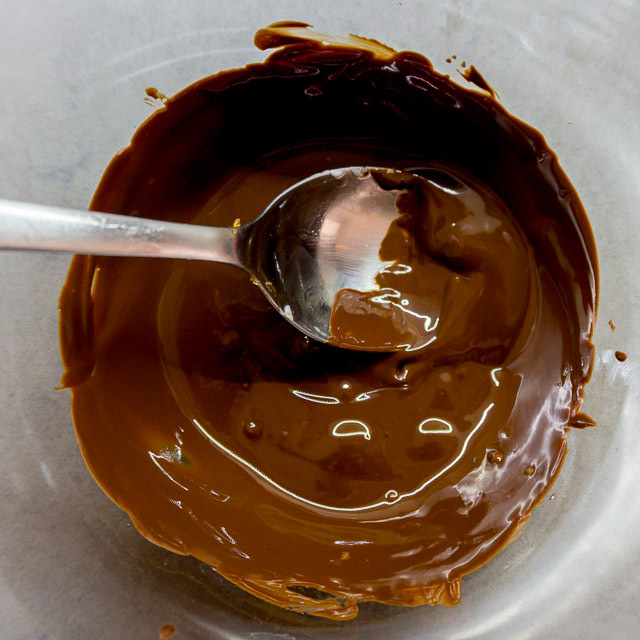 Melt chocolate either in a microwave or double boiler (see here for more information). Set aside and let it cool for 10 minutes. 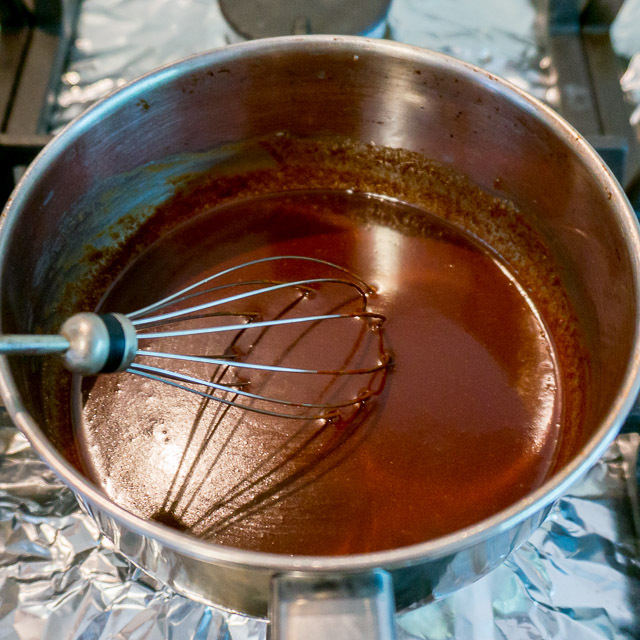 While the chocolate is cooling, boil a kettle of water. Mixing Bowl Method: Measure the rest of the ingredients (flour, sugar, cocoa powder, baking soda, vanilla, butter, honey and egg) except water in a mixing bowl. Add in the cooled, melted chocolate. 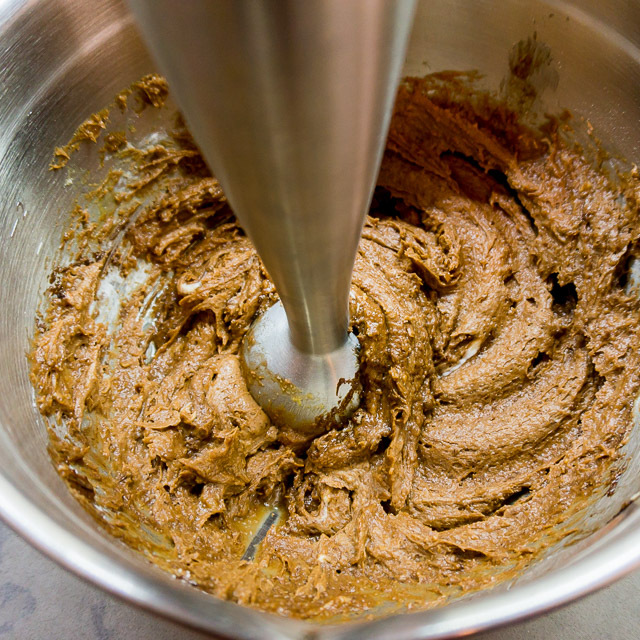 Blend with an immersion blender or electric mixer until everything is well-mixed together. The batter will be quite thick so you might need to scrape the sides and bottom of the mixing bowl a few times with a spatula so that everything can be blended together. Add in ⅓ of the boiling water, blend until incorporated, then repeat until all the water has been incorporated (see Naggy Notes). Scrape the sides and bottom of the mixing bowl to make sure everything is incorporated together. 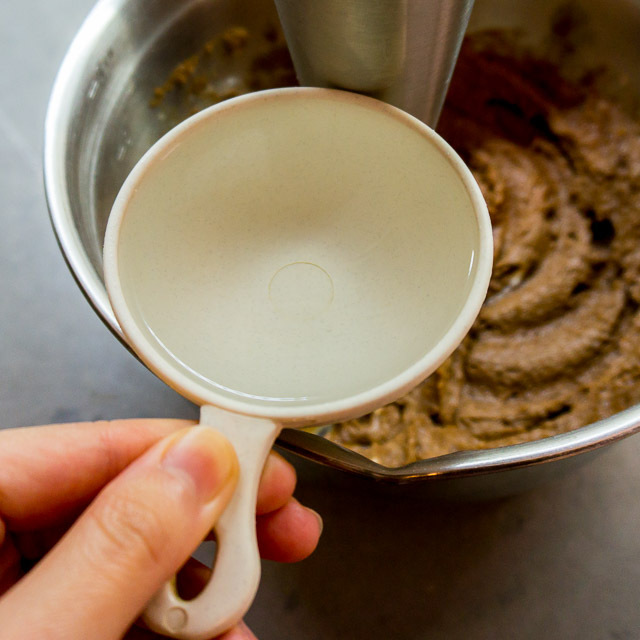 Food Processor Method: Measure the rest of the ingredients (flour, sugar, cocoa powder, baking soda, vanilla, butter, honey and egg) except water in a food processor. Add in the cooled, melted chocolate. Pulse until the ingredients are blended together. Keep the food processor running then add in the boiling water through the funnel. Scrape the batter into the prepared cake tin. Tube pan: Bake in the center rack for 30 to 40 minutes until a skewer inserted into the centre comes out clean. Let the cake cool in the tin completely on a wire rack. 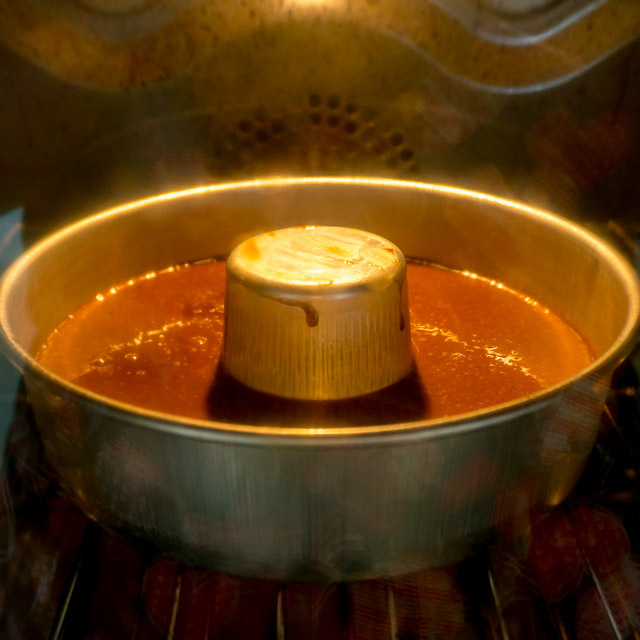 Round cake tin: Bake in the center rack for 1 to 1½ hours until a skewer inserted into the centre comes out clean. Tent the top with an aluminum foil if the top looks like it's going to burn. Let the cake cool in the tin completely on a wire rack. 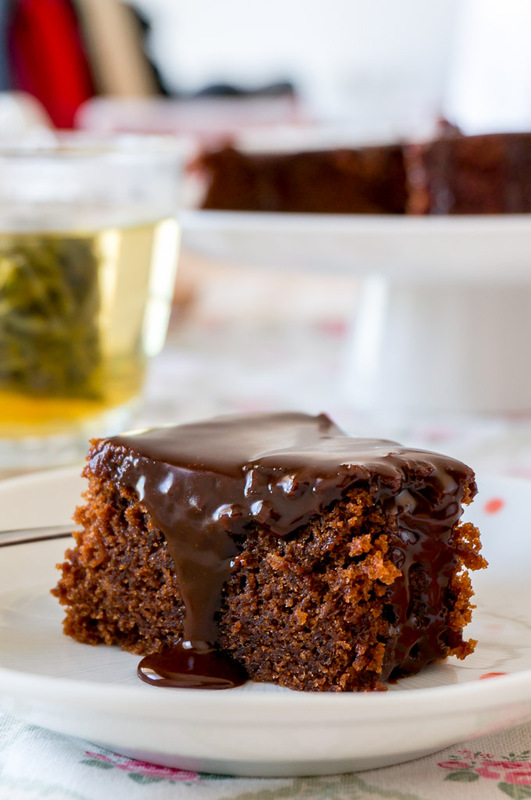 To unmould the cake, run a spatula along the edges of the cake tin and turn it out on a plate. Peel off the parchment paper if it's stuck to the cake then turn it right side up on a serving plate. Whisk honey and water in a small pot and bring to a simmer. Remove from heat and add in dark chocolate. 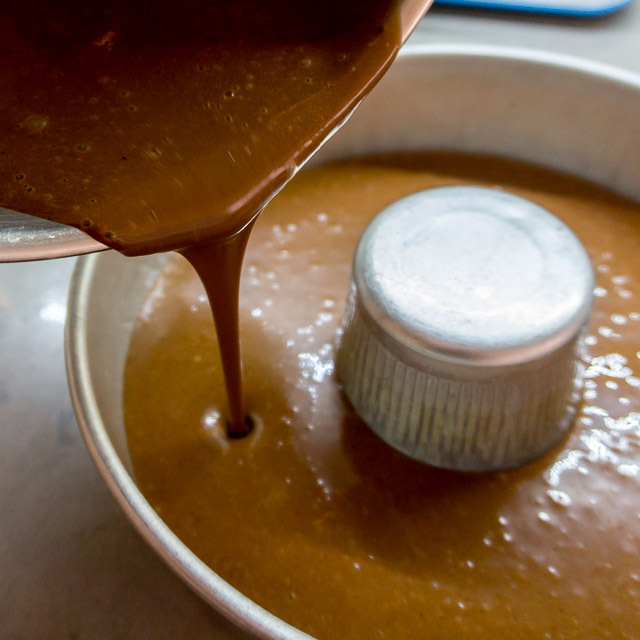 Whisk until chocolate has melted then add in the icing sugar. Whisk until the icing sugar has been incorporated. Let cool slightly for 5 to 10 minutes until the sauce has thickened then pour it over the cake. - Do not add water while the immersion blender or electric mixer is running as the water may hit the beaters and splatter all over, burning yourself (I've learned this the hard way). I love the simplicity of this cake! You can see how moist and delicious it must be by the photos, Jasline. I love watching Nigella’s shows and I love any kind of chocolate dessert. I’ve yet to find a dessert recipe featuring honey as a key ingredient that I truly love. This looks amazing and I like taking out the food processor to make a cake sometimes. 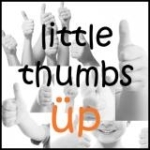 Thanks for sharing it – great pics! Some recipes just deserve to be written down and kept in a recipe book, Jasline. This sure sounds like a keeper!!! I cook the cocoa powder with honey too, they taste absolutely delicious! That is one delicious looking cake, Jasline, and being able to mix it in a food processor is a big plus in my book. That chocolate sauce sounds so very good. I bet I could eat it alone by the spoonful. Looks so decadent and rich! how rich & lush-looking. Yum!